Unique 2391-51 Periodic Inspection online practice. One month minimum, cancel any time. Designed to help prepare candidates for the City & Guilds 2391-51 Online Multiple Choice Exam. This exam is one of the suite of exams electricians need to pass to achieve full certification in inspection and testing. Using this 2391-51 Periodic Inspection Online Practice you will be confident that as soon as you start the real exam you will know that you have practised similar question to those in the actual exam and be prepared for anything the exam can throw at you. Up to date to 18th Edition. Electricians studying Level 3 Inspection and Testing need to pass the City & Guilds 2391-51 Periodic Inspection Exam. The 2391 qualifications replace the outgoing 2394 and 2395 qualifications. Electacourse have commissioned programmers and authors to develop an exam simulator which accurately replicates the experience you will have when you take the actual exam at an approved examination centre. 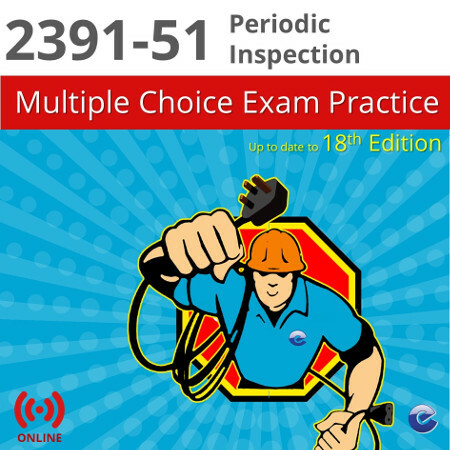 The Electacourse 2391-51 Periodic Inspection Online practice is stuffed with features to help you prepare for the Online Multiple Choice Exam. No minimum subscription period. Unless cancelled by you, we will cancel the subscription after 12 months after which the content will no longer be accessible nor will we be taking any subscription.